For that have experienced a bad camping experience when it comes to toilets, a camping toilet is all you need. There are no toilets in the wild and you will not always run behind the bush especially when camping with friends and family. This is where the portable camping toilets come into play to help you. These toilets are not just for camping; they are a versatile product that can be used at any place where traditional toilet facilities are not available. In this post, we are going to review the best portable camping toilets for you to buy. These are the leading models on the market right now with excellent features and exceptional portability. Read on and choose one that will best serve your needs when camping. Camco portable camping toilet is one of the best picks to start our list with a broad range of features. 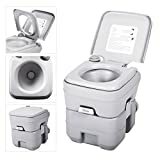 It is an excellent travel toilet with a 2.5-gallon flush tank and a 5.3-gallon holding tank. The toilet features slide valve locks that seal and prevent leakages while keeping the odors inside. The tank is secured to the toilet through slide latches. Overall, this is a sturdy bellow-yellow construction that will serve your needs on outdoor events. This is another highly portable camping toilet that is easy to assemble, carry and clean. It is a practical pick for your campsite, caravan, boat, and car. The construction of the toilet is the safe bearing of up to 130kg using ABS, PE, PP and steel materials. The toilet features a 5.3-gallon waste tank and a 2-gallon freshwater tank serving you for 2-3 days. This means you can flush it at least 50 times. The tank is detachable allowing for easy cleaning. Other features include slide latches that lock the tanks and a double layer slide valve to keep the waters and bad smells inside. This is a self-contained portable, lightweight camping toilet with an Eco-Fresh packet. It is one of the best-selling camping toilets on the market and a great pick on our list. The toilet features a contoured seat for comfortable seating and a toilet paper holder. The inner basket is removable for easy waste disposal. Overall, this is an excellent camping toilet compatible with Reliance’s standard Double Hoodie bag. It weighs a mere 5 pounds and measures 14.7 x 14.7 x 14 inches. The SereneLife is another flushable potty with a 3.2-gallon freshwater tank, and 5.3 gallons waste water tank. It features a three-nozzle flush design and allows up to 50 plus flushing. This means you can spend 2-3 days in the wild using your toilet. There is an attached seat cover which can be closed when traveling. The construction of this toilet is rugged, sturdy and compact which is ideal for use on the road. It is corrosion and a stain-resistant toilet that is quite easy to use and clean. 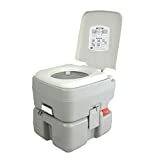 This is another sturdy camping toilet with a sturdy adult seat and thick wall construction to carry your weight. Everything on this toilet is self-contained without any external power or water connections. Secure latches and clamps help lock both tanks in place. The 5-gallon waste water tank is easily detachable without using any tools. It is quite easy to use and clean with valves for easy flushing. This is a pretty simple camping toilet featuring three locking legs and easy set up in seconds. It is a compact and foldable design for easy use everywhere you go. The toilet features a built-in carry handle. It is a strong toilet that can hold a maximum of 500lbs. The removable cover of the toilet as offer excellent ground support. It is a comfortable toilet with a bowl and a seat of standard size for comfort. A further sanitary mesh holder helps prevent slippage of waste. The bag does not come into any contact with the waste due to the patented drip edge located under the seat. This is a self-contained camping toilet with a sturdy seat for adult use. It is an excellent choice for camping, RV, boat and any other outdoor activity. The toilet features a 5-gallon waste water tank and a 3-gallon freshwater tank. It also features a matte finish that helps conceal all the scratches. Overall, this is a one-piece leak-proof toilet made of the high-density polyethylene. It comes fully assembled for immediate use. 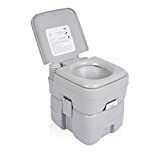 This is a pretty solid and sturdy personal toilet ideal use on the road, fishing, hunting, boat trips and other outdoor events. It is a quality choice with 5-gallon waste tank and 3-gallon freshwater tank. It features a bellow and allows 50-70 flushes before refilling with fresh water. The wastewater tank is removable with easy. It features side latches for a secure fit. Removable cups on the toilet allow for faster water refilling. Transportation of this toilet is also simple due to handles on both sides. Overall, this is a high-quality camping toilet with a slide valve to keep odors inside. 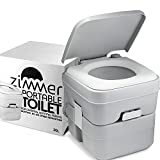 Just as the name suggests, this is a highly portable toilet for all your camping and hiking activities. It is lightweight since it is made of plastic something that allows for easy carrying. The toilet features a removable cover to seal the odors inside. It is an 8-gallon toilet waste tank to avoid any mess and allow for easy cleaning. The toilet measures 17 x 16 x 14 inches which a standard size for easy movement wherever you go. The Eathtec is our last pick for the best camping toilets and a great selection to consider. It is a grey toilet with a 5-gallon waste tank. The toilet is made of plastic and pretty lightweight for easy carrying. It also features a toilet lid to help seal the odors. The bowl is non-stick and features the nanotechnology polymer to allow for easy cleaning. Overall, this is a sturdy and lightweight toilet capable of holding 440lbs. If you camp or spend most of your time outdoors, then you know the importance of buying an excellent portable camping toilet. These toilets come in handy when we are in the wild. Make sure you go through our reviews above and only buy the best. We’ve only reviewed the best portable camping toilets for you to buy this year. You’re guaranteed of good value for your money. Read more about the toilet safety frames.